The 8th edition of msg Maraton Apuseni, a competition officially certified by ITRA and a member of the Circuit of the Carpathians, ended on Saturday, May 26th 2018. The organizers counted approximately 1650 validated registrations out of a total 1900 registrations, and 1487 runners present at the start of the 5 races: 74 ultra marathon runners, 244 marathon runners, 607 half marathon runners, 320 cross runners, and 262 family runners. This year, msg Maraton Apuseni premiered a brand new race, the ultra marathon with a 73.6 km course and +3729 altitude gain. Robert Hajnal won the race, followed by Gabriel Cojan and Adrian Costea. The women’s podium found Viorica Malai, Dana Șurubaru, and Gyongyi Lenart in the top 3 places. The full results of the races can be viewed here. msg Maraton Apuseni counts among the most popular mountain running events in Romania and is the most appreciated event in Transylvania. The competition reunites 5 races, ultra marathon (73,6 km real length, + 3729 m altitude gain), marathon (43,7 km, + 2557 m altitude gain), half marathon (21,1 km, +1061 m altitude gain), cross (7km, +440 m altitude gain) and the family race (3,2 km, + 153 m altitude gain). A thorough description of the picturesque courses that take runners through the famous nature reserve “Scarita Belioara” in the Apuseni Mountains, can be read here. Created for different mountaing running abilities, these races range in technicality, the most challenging part being the section “The Rocks” included in the ultra and the marathon courses, where participants have to down climb a rocky area. The 9th edition is announced for May 25th, 2019. 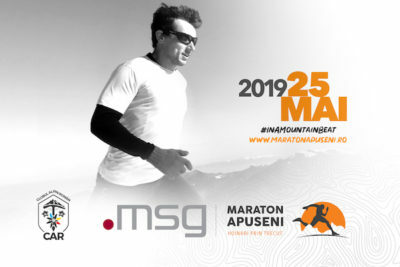 The Romanian Alpine Club – Cluj University branch, together with the official partner msg Romania, announce a new successful edition of msg Maraton Apuseni, where everybody enjoyed a day in nature, under the edition’s motto: #inamountainbeat. This year marked a premiere for msg Maraton Apuseni. The ultra marathon was officially introduced among the competition’s race list, and saw 75 runners cross the starting line on May 26th at 6AM. All the runners who managed to successfully finish the ultra marathon receive 4 ITRA points, and those competing in the marathon receive 2 ITRA points, as the competition is now certified by the International Trail Running Association. The official results of the races can be viewed here. At the Skiland basecamp, participants could enjoy a variety of different activities, designed to entertain all ages. Children were invited at the Family zone, where they took part in face painting, treasure hunts, or other creative workshops. The Minor Swing chill out zone brought a well-deserved touch of relaxation for the competition, while those looking for a thrill could try the climbing wall. But the whole day carried a festival-like atmosphere, thanks to the soundtrack provided by DJ Eectroclown. One goulash party and a mountain movie screening later, it was time for the winners to take their places on the podium, followed shortly by the participants’ raffle, where a lucky few received different prizes provided by sponsors. The story of the 2018 msg Maraton Apuseni came to an end with a campfire, the first quiet moment in a very exciting day. The best moments of this years’ competition on your official Facebook account or on the Time-It platform where all the photos taken by our team of volunteers will be uploaded. Consiliul Judetean Cluj, Salvamont Cluj, Pro Nutrition, NIVEA MEN, Auchan, Moldovan – Carmangeria Sinnicoara, Izvorul Minunilor, Nutrend, MOUNTEX, Adrenalin Park, Garmin, Trisport, ZuMont, La Sportiva, Ursus Cooler, Alpin Expe, Columbia, Elfst, The Genuines, Adventure Camps, Camps4u, Skai Urban Crag, Carturesti, Bunicu’ Nelu, Exploratoriu, Polare S&G, Mini Reactor, Solaris, Outdoor4U, Jazz in the Park, Electric Castle, Zile si Nopti Cluj-Napoca, Kiss FM. The organizers would also like to thank the team of 200 volunteers for their contribution and effort. 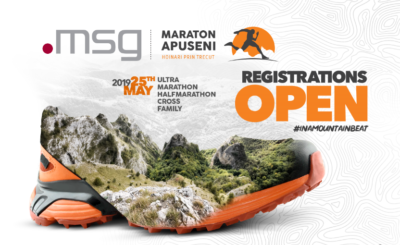 We’ll all remain close to the mountain running community #inamountainbeat for now and invite you all to take part next year in the 2019 msg Maraton Apuseni, which will take place on May 25th.